Recycling continues to grow significantly across the country, and more people recycling means more interest in buying recycled products. There may be no product segment today offering a greater selection of recycled, or “green” products than in office supplies. There are literally thousands of office products using recycled materials that are kinder and easier on our earth. Just as importantly, these products now have excellent quality, offering office supplies choices to small business that are gentle on the environment and functional for the office. The most common recycled products for the office is copy paper. Most offices number one consumable office supply is copy paper, so people rightly think they can do more to help the environment buy buying copy paper with recycled content. Recycled paper-making technology has improved to the point you can purchase very high quality and high brightness recycled paper without sacrificing performance. My favorite is Navigator Premium Recycled Paper (#SNANR1120), because it’s high 95 brightness is actually better than most non-recycled copy paper, yet it contains 75% recycled material and 30% post consumer waste. 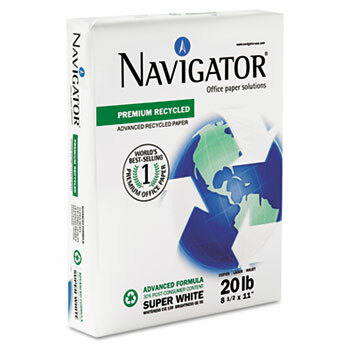 Navigator Recycled Paper is a great choice - 75% recycled and 95 Brightness! Other office supplies that are high use, but have great recycled options are binders — standard 3 ring binders for business. The good news is most of today binders all contain recycled materials. Universal brand binders are my preference because of their value compared to national brands. Whether you buy a common 3 inch binder or go all the way up to a big 5″ binder size, they all contain 48% recycled content in the vinyl and card board inserts – and 38% of that is post consumer waste! Similar to binders, standard file folders and hanging folders today all contain recycled content, which is great for our environment. Most will contain a minimum of 10% recycled material. But if you’re looking for filing products that are even more beneficial for the planet, check out the line of Earthwise filing products from Esselte. Hanging folders in this line contain 100% recycled material, and 30% of it is post consumer, really the true measure for how “green” a product is. 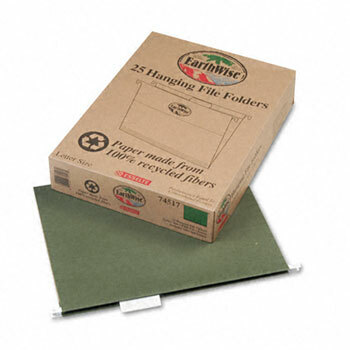 Earthwise also has file folders with a whopping 60% post consumer waste, and the folders are made with 100% recycled fibers. Earthwise folder products are 100% recycled material! Where is the best place to find a huge selection of “green office supplies“? I have two suggestions. First, never shop at a mega-office superstore like the Big Box retailers. They no longer have the best prices, and the service is terrible. Not to mention their selection of recycled products isn’t that great. Second, I buy my office supplies online, and always buy from an independent company that donates significantly to the community; one that does good work by supporting great charities with 50% of their profits. Search out those companies that practice conscious capitalism, and treat the environment, the community, their employees, vendors and most importantly customers with respect and honesty. So we’ve covered the really easy items which you can switch over to recycled alternatives. What about more obscure products. House of Dolittle makes a full line of desk calendars and appointment books for business that are 100% post consumer recycled material. Marcal is a great line of recycled paper towels and toilet tissue that are both 100% recycled with 60% post consumer waste, and are awesome because they are lint free. Ampad makes a line of recycled writing pads, scratch pads and other office paper items called Envirotec that are great “green” alternatives. And, how about using rechargeable batteries for all those office electronics. It keeps hazardous batteries out of landfills, and really helps our earth. Last, how about recycled scissors – Kleenearth brand Westcott scissors by Acme. The plastic handles are 70% recycled plastic! There are really thousands of options and my office products company has over 200 categories alone! Recycling is a growing thing and that is good – the majority of households recycle in some way. Buying recycled products is lagging behind, but today there are many great quality green office supplies options that will let you Do Good Work while helping our Mother Earth. Do a little research while shopping, buy recycled products, and enjoy today! It’s a small way you can feel good about your choices, and help future generations. This entry was posted in Charities, Conscious Capitalism, Cool & Interesting Stuff, Office Supplies Shopping Tips and tagged conscious capitalism, Green Office Supplies, office products, Office Supplies Online, Recycled products. Bookmark the permalink. Thanks for the information. Good to see someone is looking out for the environment. It’s the least we can do. With so much recycling going on, it’s important people buy products with recycled material in them as that completes the “green” loop. Thanks for your comment. Navigator Premium Recycled paper is my favorite brand by far. Never jams, really high brightness, awesome price and 75% recycled. Can’t beat it! Wonderful blog post, I will be viewing back again frequent to look for improvements. Thanks Clarrisa – office supplies can be a little dry, but we’ll try to keep it interesting and informative. Many thanks, I’ve recently been hunting for info on this issue for a long time and this particular site is the best I have come across up to now. Glad you liked it Raguel. Recycling and treating our environment with respect is a high priority for us!